Mobility has forever transformed the way we work, communicate and socialize. Originating as a consumer-centric phenomena, mobility benefits have compelled organizations to rapidly adopt it as a way to boost employee productivity and customer engagement. This paper discusses the unique risks associated with mobile devices and the capabilities enterprises should consider when building their roadmap to a secure mobile enterprise. 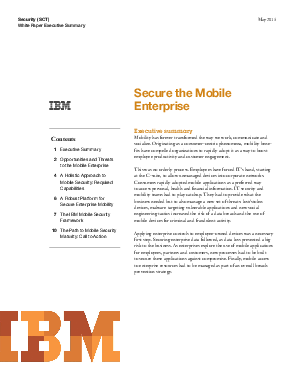 We introduce the IBM Mobile Security Framework, an end to end strategy and solution that addresses mobile security requirements across the device, the content, developed and transferred between devices, the mobile application, mobile transactions and mobile identity and access management requirements. Built on IBM’s unique threat intelligence platform, the Mobile Security Framework automatically fuses context and risk awareness into each component of mobile security, to maximize mobility management and security effectiveness.